Milton Fabrics can create many types of custom window treatments in our onsite workroom. The opportunity is available to produce any look or fashion statement that you desire and our skilled craftsman will insure your project is of superior quality. can perform many functions in a room. They can provide light and temperature controls, create a frame for the view or supply needed privacy, and create a dramatic statement or a quiet background for the rest of the furnishings. can do all these things by allowing for many personal considerations. Custom window treatments are made specifically for your windows. They will be the perfect size – length, width, and fullness to create an individual look. The fabric choices are extensive and provide a wonderful opportunity for creative expression and functionality. Color can be used to create a focal point or a serene backdrop for the room. In addition, the use of a Sheer Fabrics can provide protection from sun and glare while not totally obscuring the view. A heavier fabric can provide a buffer from temperature and noise. Similar treatments can achieve completely different results depending on the type of fabric that is chosen. Silks, Velvets, Damasks and Embroidered Fabrics provide a formal ambiance. A similar window treatment constructed from a cotton print will impart a more casual atmosphere. A standard window panel can be fabricated in many ways reflecting the taste of our customer and décor of the home. The option of pleats, rod pockets tabs or grommets can create a dramatically different look with the selection of Fabric and Trim enhancing the impression. A variety of looks can be designed by layering treatments. Valances, Swags and Jabots can add drama and definition while a Cornice will add an architectural element. These can all be layered over sheers, stationary panels or drapes. Shades and Blinds also provide an opportunity for layering and many options for light and temperature control. They can block the morning sun, keep out the heat of the day or provide privacy in the evening but can be raised when appropriate. 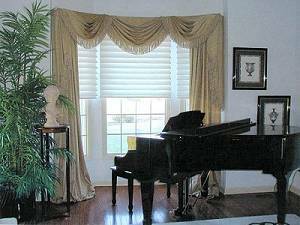 Custom Roman Shades and Balloon Shades have the advantage of a perfect fit and unique choice of fabric, trim and style.